Thermoplastic PVC (polyvinyl chloride) Schedule 80 is light, flexible, and durable and provides exceptional corrosion resistance. Due to these and other properties of this high quality thermoplastic, substantial savings can be realised during installation and ongoing service life. PVC Schedule 80 can withstand temperatures up to 1400F (600C). PVC Schedule 80 thermoplastic is highly resistant to acids, alkalis, alcohols and many other corrosive materials. PVC Schedule 80 is ideal for process piping and most service piping applications. PVC Schedule 80 thermoplastics will not rust, scale, pit or corrode and will not be affected by electrolysis. This range of pipes and fittings will guarantee many years of no maintenance, leak-free service. For buried applications, PVC Schedule 80 will not be affected by soil conditions or galvanic corrosion. Painting is not required for indoor non-exposed applications. For outdoor installation where piping may be exposed to significant sunlight, we recommend painting with two coats of a white or light-coloured water based outdoor latex paint for added protection. 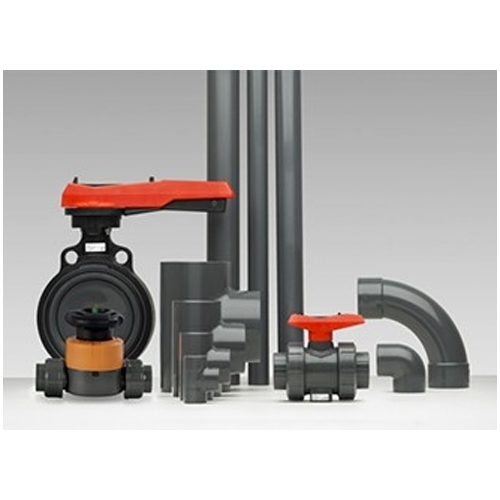 PVC Schedule 80 fittings, pipes and valves have been found to be suitable for more than 50% of the corrosive and non-corrosive applications within the chemical process industries. The establishment of strong industry standards and specifications, plus third party certifications through NSF, provides the specifying engineer, contractor and end user with a tested and accepted piping system to solve their corrosion problems.